There are only two absolute certainties with this year's bracket: Syracuse and Kentucky will be No. 1 seeds. Other than that, everything is wide open. With six teams (seven if you include a Marquette team that is playing as well as any team right now) vying for the final two No. 1 seeds, the final few weeks will be crazy intense. Based on a full body of work and the RPI, which I would like to give small credence to but the selection committee ranks most of its teams this way, Michigan State and Duke are the most deserving teams of No. 1 seeds as it stands today. When it's all said and done, I believe it'll come down to the following: If Duke wins the ACC (sweeping UNC would have to happen for that to be the case) and wins the ACC Tournament, the Blue Devils would get a No. 1. The same can be said for Michigan State winning an outright Big Ten Championship and following that up with the school's first Big Ten Tournament title since 2000. If either of those things don't happen, the door is left open for the following teams to take No. 1 seeds: Kansas, Missouri, Ohio State and North Carolina. If Kansas wins the Big 12 regular season and tournament championship, the Jayhawks would likely get a No. 1 seed at the expense of either Duke or MSU, one of which must have slipped up in its conference tourney. The same scenario would hold true for Missouri. If the Tigers win the regular season and conference tournament, beating Kansas in the finals for instance, Missouri would have quite a late-season resume for a top seed. North Carolina winning the ACC regular season and ACC Tournament titles would put the Tar Heels on quite a hot streak and would give UNC an edge over Duke. The real wild card is Ohio State. As bad as the Buckeyes have played recently, beating MSU in East Lansing to potentially win a share of the Big Ten Championship and then parlaying that into the conference tournament title would make OSU an interesting case for a No. 1 seed. Based on recent history, my guess is the No. 1 seeds will go to either Duke or North Carolina and either Kansas or Missouri. No conference will get two No. 1 seeds. This isn't to say that with a Big Ten Tournament finals loss that Michigan State couldn't get a No. 1 seed, it's just that the Spartans don't play well in the tournament and a 3-game gauntlet of say desperate Northwestern, Wisconsin and Ohio State or Michigan might be too much. *As per most bracket projections, this would be my projected field if the season ended today. Undoubtedly, teams in current "First Four" games will need to play their respective ways into the tournament because stolen auto-bids will shrink the at-large pool by approximately 4-6 teams on Selection Sunday. 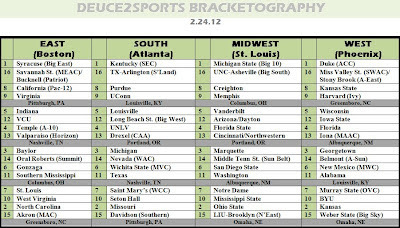 First Impression: There are a handful of "bad" teams that have to be in the bracket because of so many at-large spots. Bracketologists everywhere have been trying to throw dirt on Seton Hall, BYU, Texas, Washington, Alabama, VCU, Iowa State, Arizona, Dayton, Cincinnati and Northwestern for weeks. The fact is, some of those teams will make the field and, as of today, all of them grace the Field of 68. Can you imagine a play-in game between Arizona (3rd place in the Pac-12 team and Dayton (the current 7th-place A-10 team)? If you want a better matchup, how about look at Cincinnati (one of the worst nonconference schedules in the country) against Northwestern (a current 16-12 team that's 6-9 in the Big Ten). 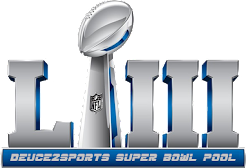 That's what the Play-In games (or, to be politically correct, the First Round games) would be today. Those are NIT matchups, folks. And the truth is we might see a few NIT matchups in this year's NCAA Tournament. Biggest Riser: Kansas State (No. 10 to No. 8). When you're a bubble team and you have back-to-back road games against Baylor and Missouri, a coach has to be thinking, "Let's get one of the two." Kansas State got both, and in fairly impressive fashion. The Wildcats are clicking right now and will be dangerous wherever they're seeded in the bracket. Kansas State could be a No. 7 seed, but with so many Big East teams on the 2, 7 and 10 lines it was tough to juggle. Biggest Fallers: West Virginia (No. 8 to No. 10). A lot of people think the 'Eers could be on the wrong side of the bubble. The fact is, look at the resumes of the dozen at-large teams seeded behind West Virginia and you'll know Huggy Bear's team is still safe. Now, I wouldn't recommend losing out and a notable win (Marquette at home tonight) would be a ticket-puncher type of victory. LAST 10 TEAMS OUT: NC State, Miami, Xavier, Colorado State, Minnesota, Stanford, Oregon, St. Joe's, UCF, Loyola Marymount. NOTES: It's hard to imagine Xavier missing the NCAA Tournament but the Musketeers just aren't winning games. At 17-10 (8-5 in the A-10), Xavier is still clinging to pre-brawl wins (at Vanderbilt, @ Butler, vs. Purdue, vs. Cincinnati) but could really use some new marquee victories. Next Wednesday's game at Saint Louis would be a big get while the A-10 tournament could provide another chance against Temple. The Owls and the Billikens are both dancing. Dayton is currently in the field. Without beating any of those teams again, Xavier's post-brawl resume is pretty thin.